"Secrets From "The Man" Who’s Sold More Than $6 Billion In Products Using These Direct Response Methods"
Imagine how easy marketing would be if you could consult an expert for all your business dealings. Someone who has already made the mistakes you’re about to make and can tell you a better approach – a winning approach. It could save you thousands and make you millions. 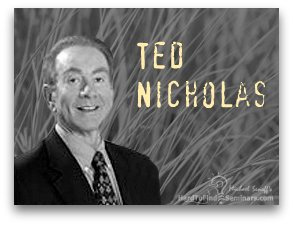 Ted Nicholas is doing just that and in this interview you’ll hear some of his tried and true methods that have earned him his guru status. According to Ted Nicholas, most copywriters think it’s important to cater to as many prospects as possible, but if you cast your net too wide, you’ll neglect your niche-specific customer and essentially shoot yourself in the foot. And in this interview, you’ll hear how to make sure your marketing is narrow, targeted and as effective as possible. • How Ted consistently gets 80% off his magazine advertising. • An analysis of one of Ted’s sales letters. Ted says he’s an entrepreneur first. He started out with zero, knows what it’s like to be on the other side of the desk, and knows how to get people into the mindset to succeed. So if you’ve ever dreamed of having a guru in your pocket to consult whenever you need to, this audio interview is for you. DISCLAIMER: If you order something from Ted I will make and affiliate commission on your order. Listen To Ted Nicholas On Speed! This is the same Ted Nicholas interview as above except it's been enhanced with www.SpeedUpMyMp3.com software. The "regular play interview is 80 minutes. This one has been speeded up 145% of it's regular speed and only last 55 minutes. Enjoy the extra 25 minutes of "free time" you gain by listening to accelerated audio. You can download a free trial of the software by clicking on the dog's heard below. Speed Through Audio With Your New "Audio Time Machine"
You'll save hours and hours of precious time ordinarily wasted by listing to slow spoken word audio interviews, teleseminars, CD programs and lengthy seminars. Listen faster and faster then you have ever read before and understand and retain every word with out the chipmunk effect. You'll gain hours in a day, weeks in a month and months in a year all from this amazing time-saving tool.